"My husband and I just moved into a newly built home in Marietta, Georgia. We used the Samuel K Designer Window treatment on 3 windows upon the advice of our interior designer. She promised that the finished product would exceed our expectations and she was right! One would be hard pressed to distinguish the finished product from actual stained glass unless you walked right up to the window and touched it. Samuel K. was even able to duplicate the design of our glass front door for the window above our bath tub.amazing! These windows offered us the look we wanted, reducing the UV light and eliminating the glare on the 50 inch TV across the room.It was in fact a home run for us! Thank you Sam.."
"I need to let you know the quality of Samuel Ks laminated overlay. I was looking for the look of stained glass, without the price of it. I had a bad photo of what I was looking for, and they took it and produced a masterpiece to my dimensions. This will be the focal point of my house renovation, and the process was easy. Plenty of communication during the design process and the color selection process. I would recommend Samuel K to anyone. Good, honest, and upfront folks. Thanks so much! Jeff"
"Just wanted to take a moment to thank you for the superb service and a flawless product. The revised design you came up with is perfect for my rennovated kitchen. You were ahead of schedule. Your installation kit contained everything I needed. Instructions were concise, clear and effortless to follow. Installation took only minutes. And the end result is wonderful. How grand to work with a company that actually delivers on its promises! I've attached a before and after photo, in case you're interested. The new window puts the perfect finishing touch on my new kitchen. Thanks!" "As a designer, I am always looking for creative and unique ways to detail windows for various applications. A very cost effective alternative to stained glass was discovering Samuel K window treatments, a universal window application. 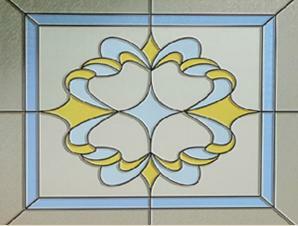 I have used their product on several installations and my clients have been blown away by how authentic the product mimics the look of stained glass but for a fraction of the price! We select the style then design the color composition to fit our requirement, super simple. Both quality of the product and service have been fabulous! Sara Sara K. Arlin, IRIS Principal Homescape Designs "Interior Design is Our Domain""
"The light blue and canary yellow colors were a perfect match in my bathroom. We are thrilled with our new window." 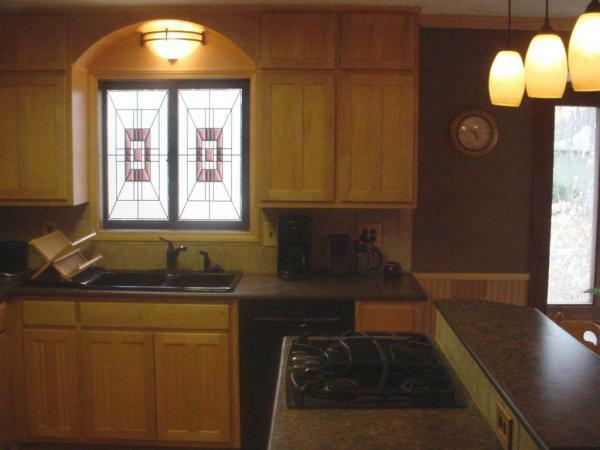 ""I purchased 2 stained glass appliques, for a sidelight and a transom. I was a little leary about the installation. It was VERY easy to install!!! I had both completed within a matter of minutes! They look great, inside and out!!! I would definitely recommend this product - well worth the money!"" "I have received the Designer Window and it fits perfect. Thanks for making this right! So easy to apply and it looks wonderful! As always, a happy customer!" "Working with you to resolve the side light issue was truly a great experience! Developing the right design of the Fleur-De-Lis was tastefully done, and compliments my front entrance setting to a "T"!!!!" "We have ordered from Samuel K on two different occasions and are extremely pleased. The overlays are beautiful and the customer service we received was outstanding. We installed Windsor Frost on the sidelights in our front entry and Angelina on the windows on either side of our fireplace. The overlays are a superior solution for windows that would otherwise require sheers or blinds providing privacy and beauty. 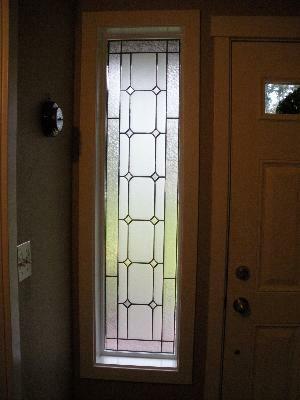 We have received many compliments from guests; they cannot believe these are not leaded glass. They are so easy to install; each window was finished in less than 15 minutes. Many thanks to Samuel K for adding a unique touch to our home!" ""I have a 13" x 57" clear glass window next to my front door and thought the stained glass applique would be the perfect solution... IT WAS! Took all of 10 minutes to install it and it looks like a window that would have cost thousands! I'm thinking the windows in my bathrooms would be perfect for this approach too. Great product, highly recommended!""